What’s so cool about Louisville? So, why have 31 scientists and 90 operation staff, technicians, ships crew and drillers travelled from around the world to get on board a boat in Auckland, New Zealand to sail into the middle of nowhere? To study the Louisville Seamount Trail of course! The Louisville seamount trail is a chain of volcanoes that stretches for over 4000 km. 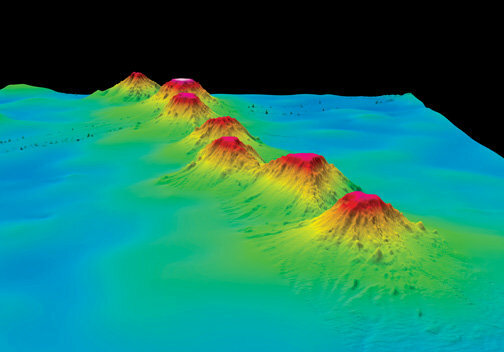 The oldest volcano, which is right next to the Tonga-Kermadec Trench, is around 80 million years old. At the south-eastern end of the chain, the youngest volcano is thought to be around 1 million years old. The linear chain appears to have an age progression along its length, meaning that they get older as you go from the SE end of the chain towards the Tonga-Kermadec Trench (take a look at how the dates change in the picture – Ma means millions of years ago). The volcanoes are also what we call ‘intraplate’ volcanoes, which means that they are not found on plate margins where we expect to find volcanoes, like around the Pacific Ring of Fire. All this suggests that the Louisville Seamount Trail is the result of hotspot activity and could be the SW Pacific equivalent of the Hawaii-Emperor Seamount Trail. Hotspots are thought to be stationary thermal anomalies in the mantle that may originate at the core-mantle boundary. These fixed points, and the trails of volcanoes that they produce, have been essential in our understanding of plate motions. For example, if the volcano chain is 1000 km long, and there is an age gap of 10 Ma between the south-eastern most volcano and the north-western most volcano, then we can infer that the plate has been moving over the hotspot at a rate of 1000 km per 10 million years, or 10 cm per year, to the north-west. However, when the Emperor Seamount Trail was drilled during ODP (a former version of IODP) Leg 197, the scientists found that during a period between 50 and 80 million years ago, the Hawaii hotspot actually moved! In fact, its latitude changed by 15° over this time. So, if Louisville is a SW equivalent of Hawaii, did its hotspot move as well? Are hotspots really fixed or do they wiggle about a bit? Computer models have suggested that the Louisville hotspot may have wiggled by around 2.5°, this wiggling is shown by the multicoloured worm in the picture. We’re drilling seamounts of the same age as the Emperor Seamounts to test this. How do we test this idea? We are hoping to drill through at least 30 lava flows from each seamount during this expedition. We can date these lava flows using a technique called radiometric dating (for those in the know, we hope to get 40Ar/39Ar age dates). On each individual lava flow, we also hope to get detailed paleomagnetic data. This data is collected by three brilliant paleomagnetists on board. When a hot rock cools (below the curie point), its magnetic minerals align to the magnetic field of the earth at the time it cools. The earth’s magnetic pole can changes over earth’s history. For example, did you know that right now the magnetic pole is actually in Canada and not in the North Pole?! That is why you set a declination on your compass. So, paleomagnetists can measure that alignment in the rock. If they analyse many rocks over a period of around 1 million years, these values for magnetic north should roughly average out to be the same as geographic north. Still following me? So, if there is still an inclination in the value they get, this must be due to the latitude at which the rocks formed. Right now, the Louisville hotspot is at 50°26’S and 139°09’W. So, if the latitude that is calculated for our volcanoes is different from that location, we know that the hotspot has moved over time, over what distance and when! Clever stuff, huh?! In my next blog I’ll tell you why volcanologists are so interested in the Louisville Seamount Trail!